Over 800 participants signed up for the first 30:30 challenge, completing 30 minutes of exercise a day for 30 days throughout June. A survey of participants revealed that 72% are now taking part in more regular exercise because of the initiative. Jenni Anderson, a Trustee of the Active Essex Foundation and Fundraising Director at the Duke of Edinburgh’s Award, said: “A strong commitment to regular physical activity is absolutely essential in order to maintain positive health and wellbeing. “It doesn’t have to be expensive, time consuming or even hard work to engage with sport and physical activity. In fact, there are many activities that are free and accessible to everybody – so all Essex residents can lead healthier, more active lifestyles. I took part myself and thoroughly enjoyed the challenge!”. The survey also revealed that 7 out of 10 participants have experienced benefits to their mental wellbeing, while 42% tried a new activity for the very first time. Activities included; walking, swimming, cycling, yoga, Pilates and other sports. 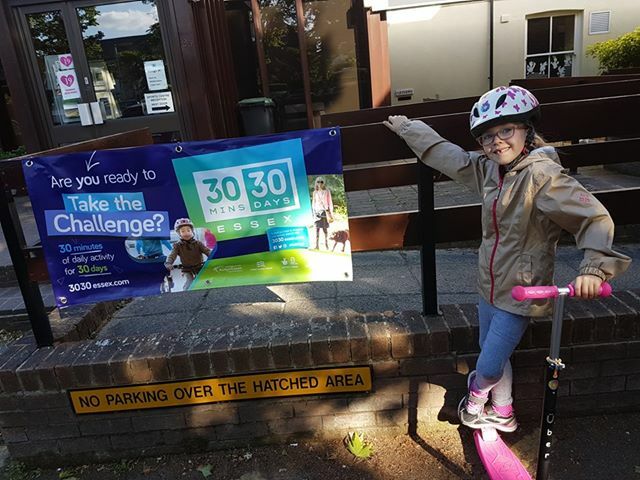 Simona Willis, 43, from Epping, said her young family’s outlook on sport and physical activity had significantly improved after taking on the 30:30 challenge – including four-year-old daughter Maya and husband Paul, aged 53. The Active Essex Foundation works in partnership with local organisations to help individuals and families living in areas of deprivation, at risk young people, people living with physical and mental health challenges, and BAME (women and girls, black, Asian and minority ethnic), LGBT (lesbian, gay, bisexual and transgender) and faith groups. The foundation’s current project and fundraising activities include working with Motivated Minds, a community interest company in Basildon, to tackle rising issues of mental health disorder, Achievement Through Football to tackle anti-social behaviour in Southend, and Canvey Get Set Youth which engages with youngsters in the Canvey Skate Park and Castle Point areas to create and support a calendar of positive activities. The county sport partnership for Greater Essex. Looking to change the lives of 1 million people by getting Essex Active. Supporting our estates based project in Loughton, breaking down generational barriers and encouraging the local community to support activities for young people.